To switch things up, let me turn to the Hamptons. Then I’ll go back to posting more pictures from Burning Man. Here are all eight of us who shared a house for a very very long weekend. Can you tell I’m the only non-New Yorker? I found it very interesting that three of us have the initials CG. What are the odds? 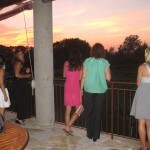 We’re enjoying the sunset at Wolffer winery. There was also a band playing in the background. Good times.